The Massachusetts Association for Community Action (MASSCAP) and the Greater Lawrence Community Action Council today joined State Senator Barbara L’Italien (D – Andover), State Senator Kathleen O’Connor Ives (D – Newburyport), State Representative Linda Dean Campbell (D – Methuen), State Representative Diana DiZoglio (D – Methuen), State Representative Juana Matias (D – Lawrence), and State Representative Frank Moran (D – Lawrence) in kicking off this year’s tax season by launching the annual volunteer tax assistance program (VITA). Watch MASSCAP Executive Director, Joe Diamond, on Centro. You can watch in English or in Spanish and learn about MASSCAP’s mission to end poverty. The Massachusetts Association for Community Action (MASSCAP) is urging Governor Charlie Baker and members of the Massachusetts legislature to include $25 million for the Low Income Home Energy Assistance Program (LIHEAP) in the next FY 18 Supplemental Budget. Everyone needs help at some point in their life. Have you ever had someone help you? Giving you that chance to succeed… someone who believed in you when you didn’t believe in yourself? 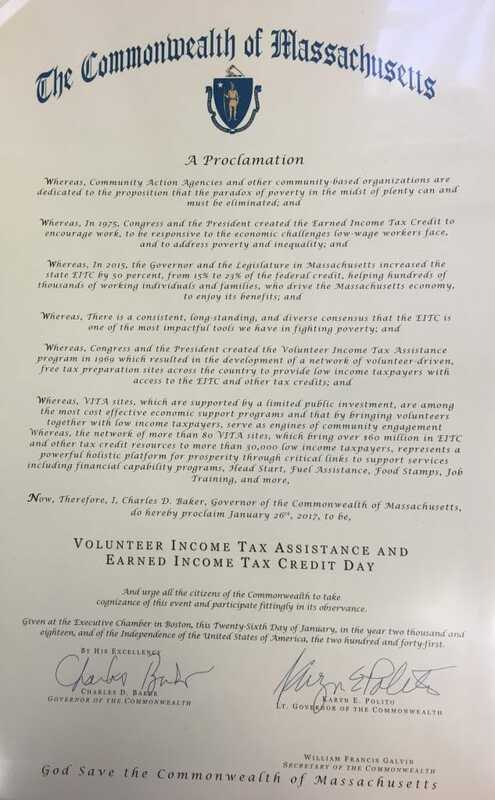 We will kickoff the start of the Volunteer Income Tax Assistance Program (VITA) for the 2017 tax preparation season. Despite threats that funding would be eliminated in President Donald Trump’s preliminary budget, the state’s home heating program will continue to keep low-income families warm this year, just as temperatures are beginning to drop. We’re working to expand the reach of Your Money, Your Goals to more people across the country with the help of our new 2018 Your Money, Your Goals cohort organizations. FRAMINGHAM – An improved economy may mean fewer households are tapping into the financial help for winter heating bills, but questions about eligibility might be playing a role. On October 27, 2017, the Massachusetts Association of Community Action (MASSCAP), along with several community action agencies, launched a statewide awareness campaign on fuel assistance in advance of the cold weather.